Lean Manufacturing PDF Lean Manufacturing PDF Lean Leveling Heijunka is the foundation of the Toyota House. Here is explained with real examples. Learn now Leveling Heijunka. 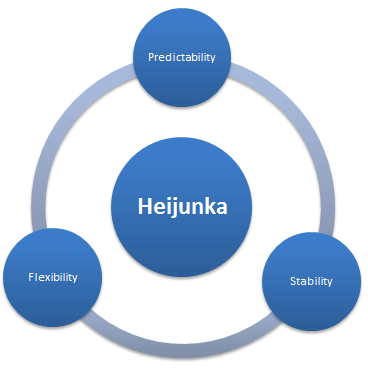 Heijunka is the foundation of Lean! The TPS (Toyota Production System) is often represented by an house. What is the most important part of an house? Heijunka means sequencing or smoothing of production. It is defined as “the distribution of production volume and mix evenly over time”. In market demand by producing several different models in small batches on the same line. Good sequencing practice reduces the need for line side labour. Where is the Heijunka in the Toyota House? Process focuses on manufacturing in large-sized lots. The idea is to manufacture the maximum number of products in one lot. Small lots more frequent change. I will give you a visual example of the 2 different way of production. Product B as much as possible. Product A as much as possible. Product C as much as possible. The goal is to reduce the set-up! The goal is to satisfy the customer request 100% of the time! I know what are you thinking! why you are wrong to be worried of set-up. I spent a lot of time for this guide. Could you spent 1 second to share? The 4 problems of Large Batch Production. The risk of unsold goods that must be kept in inventory. What do you do with old stuff! The use of resources is unbalanced. Some day you run. Some day you waste. Customers usually do not buy products predictably. If the customer decides to buy the large product early in the week the plant is in trouble. 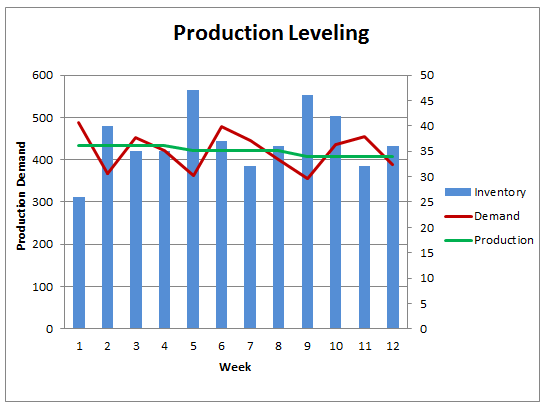 There is an uneven demand on upstream processes. Flexibility to make what the customer wants when they want it. Reduced risk of unsold goods. Balanced use of labor and machines. Can I do a question? Why it is so difficult to implent? The main reason is the companies do not work on Set-Up! Set-Up in less than 10 minutes. Believe me many firms did it! Do you want to follow Luis in Lean Logisitcs? The customer is never leveled. The customer demand is always crazy. Another very intersting post on Heijunka. to understand the math to support Leveling. are much more than just about reducing waste. at a specific time that they need it. therefore ensures the longer-term financial stability of the company. so general efficiency is promoted. by averaging production volume and type over the long term. in order to meet market demand. and becomes the heartbeat of any lean production system. and is a key factor in planning and scheduling work. to between a minimum and maximum level. which ensures a predictable, smooth schedule and avoids capacity bottlenecks. how they are performing against goals and targets. It also makes life easier for upstream suppliers who can be passed stable schedules.